I have been told that one should build the boat that best suits the nearest body of water—that’s the way to get the most use out of it. My closest body of water is a reservoir that limits powerboats to 10-hp engines, and on any given weekend sailboats, kayaks, and aluminum fishing boats abound, but there are no big powerboats. I didn’t take the advice and built a classic runabout with a 40 horsepower motor. The closest water without a horsepower limitation is at least an hour’s drive away, boat and trailer in tow. Seven years later, and now with a toddler in tow, it is nearly an all-day event to take the runabout out and we are using it less and less. 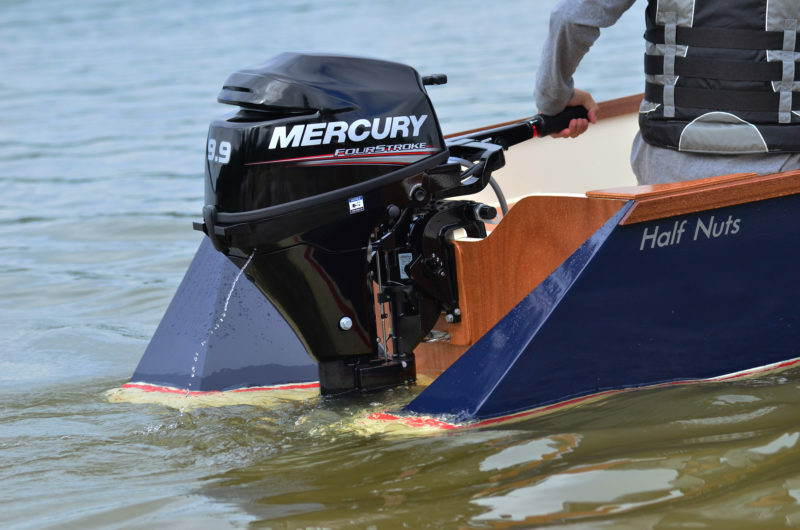 I found myself longing for a vessel to take advantage of the manmade lake just 10 minutes from home, so I began searching for an outboard skiff design that could handle our family of three with 10 hp or less. I discovered that there are many choices among small power skiffs between 12′ and 17′, and just deciding what to build turned out to be quite the exercise. I wanted something that stood out and found what I was looking for in the Tango Skiff. The transom extensions flank the motor, supporting its otherwise cantilevered weight and bringing the Tango on plane faster. The Tango Skiff has interesting hull extensions that create an attention-grabbing geometry aft of the transom. The additional running surface and buoyancy of the extensions appealed to me because of my previous experience with small outboard-powered boats. When operated solo, many of them with a conventional transom will squat under the weight of the motor and the skipper and set the bow pointing skyward. The Tango Skiff is a modern design that evolved in the early years of the new millennium as designer Hank Bravo experimented with a way to overcome the squat by adding volume and planing surface behind the motor. His 12′ prototype, powered by a 3.5-hp outboard, jumped on plane and ran 20 percent faster with the extensions than without and that he didn’t need to shift his weight forward or carry ballast when running solo. Tango Skiffs continued to evolve from that first 12′ boat and are now available in 12′, 13′, 14′, 15′ and 17′ versions. I chose the Tango 13 because it would fit in the “half” section of my two-and-a-half car garage. My big runabout, and, most importantly, my wife’s car, also still fit in the two garage bays. The Tango Skiff measures 13′ from the bow to the end of the extensions. 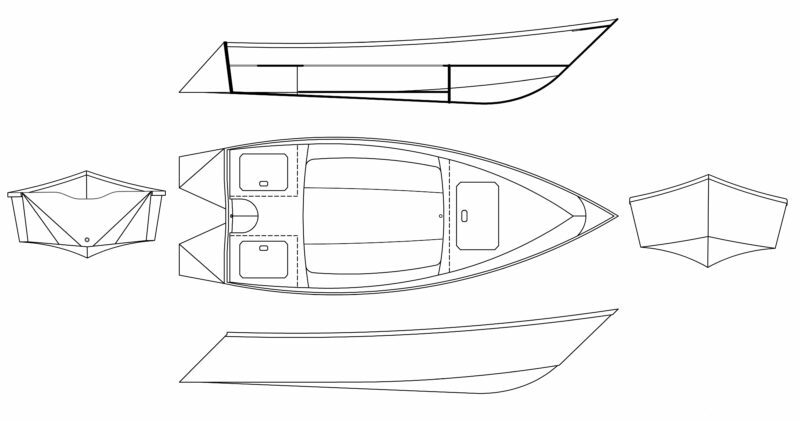 The plans for Tango Skiff come in PDF file format; no full-sized, printed patterns are provided. The shape of each part is transferred to the plywood using a grid scale shown on the plans of 1 grid square equals 1” square. Many parts are cut oversize and trimmed to fit during assembly, which helps eliminate much of the fear of not transferring something properly. The instruction manual included with the plans has lots of helpful color photos and a detailed materials list. The Tango Skiff 13 is built entirely from five sheets of plywood, three at 1/4″ and two at 3/8″. I think the most daunting part for a new boatbuilder is scarfing plywood panels together. I overcame this by doing half-lap joints that I cut with a router instead of true scarfs. I found this much easier especially on 1/4″ ply. By February the project was ready to move to the garage for assembly, but it was still too cold for epoxy, so I waited until April to do more work. Once the project was moved to the garage the assembly went quickly. Assembly is just like any other stitch-and-glue boat. The panels are stitched together and epoxied, the stitches are removed, fillets are made, and fiberglass tape is applied to the seams then a lot of sanding follows. There is one interesting departure from the normal stitch-and-glue process: a built-in chine step. It is formed when the side planking laps past the bottom planking in the forward third of the chine. This creates a void, which is then filled flush with thickened epoxy. In the finished boat, this functions like a sprayrail to keep the occupants dry. At the bow, the edges of the bottom and side panels are not butted together, as typical in stitch-and-glue construction. The side panels overlap the bottom panels; when the open angle between them is filled with epoxy, it creates a step that will knock down spray. The hull gets stitched together with cable ties around a center half-bulkhead, then the bow and stern compartments and the seats they support are added. I found the center seat flexed more than I liked when I sat on the forward or aft edge, so I added small knees beneath it for support. Two triangular panels are stitched to the extensions of the bottom panels to create the distinctive stern. The Tango Skiff 13 calls for a 6-hp motor, which is a nice fit for the boat, but I purchased a 9.9-hp, which, at 84 lbs, weighs 24 lbs more than a 6 hp. I emailed the designer about this change and while he recommended sticking to his 6-hp maximum motor size he suggested beefing up the transom. 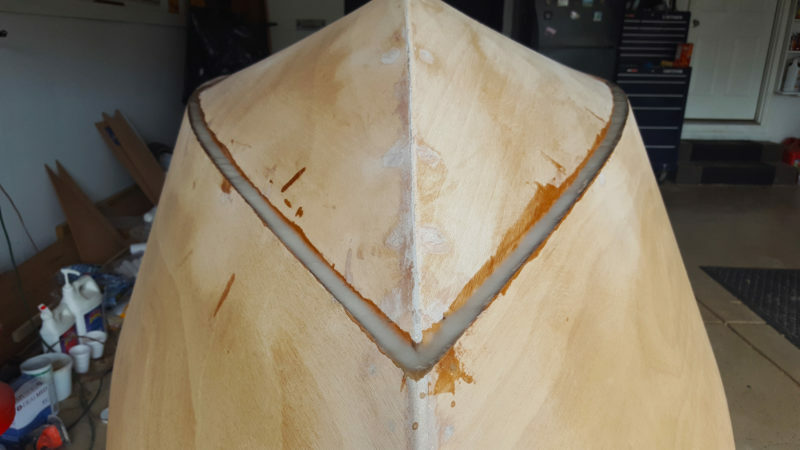 To help with the added load and strain, I added a 3/4″-thick laminated knee to tie the transom to the bottom of the boat, added an additional layer of plywood to the transom, and added 3/8″ knees to tie the top of the transom to the gunwales. With a hull weight of about 130 lbs and an engine weight of 84 lbs, the Tango 13 draws only a few inches. The Tango Skiff 13 sits lightly in the water, drawing only a few inches; the added flotation of the extensions aft of the transom clearly helps offset the weight of the motor. I was curious about lateral stability with the relatively narrow beam of 4′8″, but the boat is quite stable for a vessel of these dimensions. I believe the extensions contribute to this as well. I really like the contour the designer put into the seats; it adds another elegant touch to what is mostly a simple boat. The fore and aft seats of the TS13 provide ample storage underneath with hatches for everything needed for a day trip to be stored out of the way. The plans come with an alternative seating arrangement combined with a center console if you prefer. Another great built-in feature is the fuel tank tunnel in which the aft seat bases are divided into two separate compartments with space between them for the fuel tank. A 3-gallon tank fits nicely there and provides plenty of range. With only its skipper aboard, this Tango, with a 9.9-hp outboard, more powerful than the 6-hp motor recommended by the designer, can reach a speed of 24 mph. The Tango, thanks in large part to the stern extensions, has very little bow rise when coming on plane and will stay on plane at speeds as low as 11 mph. With just myself onboard the boat feels very light; it seems to more ride over the water than cut through it. On a windy day the boat is so light you can feel the wind trying to push the vessel off heading as the gusts come and go. 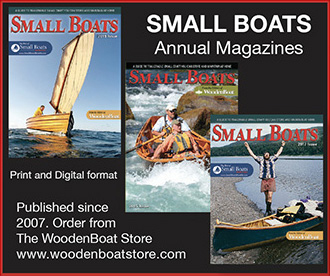 Another effect of the hull extensions is that the skiff corners flatter than similar boats. There is no skeg to provide lateral resistance, so the boat tends to skid slightly in high-speed cornering, but backing off the throttle slightly will bring the bow down enough to carve a nice corner without skidding. In slow-speed maneuvering there are no surprises and the extensions allow more than enough room for the tiller to be turned nearly hard over. The anti-ventilation plate of the motor sits just below the bottom of the extensions so there is never any worry about the prop contacting the hull. While I have not yet had the boat out in any serious chop, it rides right over small boat wakes and slowing to the minimum planing speed allows the bow to cut right through larger wakes. The little Tango feels solid for such a light stitch-and-glue skiff. With a family of three aboard, there’s plenty of room and capacity to take on almost another 200 lbs. I clocked the maximum speed at 24 mph with just a slight porpoise when riding solo at full speed, which I could attribute to the transom angle. When built per the plans, is only about 8 degrees; not angled enough for the prop shaft to be positioned perfectly parallel the bottom of the boat without shimming the motor. With my 35-lb son onboard the porpoising is eliminated and the boat hits 23 mph. With our family of three onboard (totaling about 310 lbs—maximum capacity is 500 pounds) top speed only drops to 21 mph which is rock-steady and comfortable to cruise at all day long. You can really cover a lot of water in a short time at 20 mph, so I am very happy with the decision to go with the 9.9-hp motor. It is almost too much motor when I’m solo, but add even the lightest passenger and it is perfect. My only concern with it is trailering over our rough highways and for that reason I use a transom saver to transfer some of the motor’s cantilevered weight to the trailer while transporting. If towing a long distance I may elect to unbolt the motor and remove it from the transom. 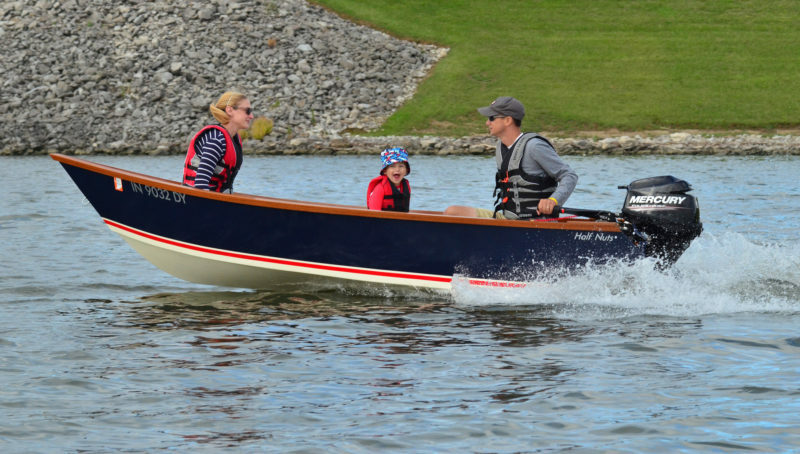 With sizes from 12′ to 17′ there is a Tango Skiff for just about anyone. It’s a wonderful multi-purpose boat that is simple and quick to build, and can be made to look elegant as well. The Tango Skiff 13 fits the bill perfectly as a small, lightweight boat for a young family or for older kids learning to handle an outboard. For more utilitarian purposes, most people would want at least the 14′ version. We look forward to exploring more waters with our Tango Skiff. *The name HALF NUTS is a play on the boat’s diminutive size and a reference both to our rambunctious three-year-old son, for whom this boat is meant, and my surviving testicular cancer. My wife bought me the plans for my birthday in August 2016 and I planned to begin the build January 1, 2017 so that our three-year-old son and I could enjoy the boat the following summer. In November 2016 I was diagnosed with stage-III testicular cancer at age 35. My world was turned upside down, but in the back of my mind I still wanted to start this project at the first of the year. It turned out to be great therapy. I wasn’t even strong enough to drive a car in the beginning of the build, but with the help of my father, we drove the 5 hours, round-trip, to pick up the BS1088 plywood in January as planned. We got right to work, and in my basement I transferred and marked each part on the plywood. My Dad cut them out with my sabersaw as I was too weak from chemo to cut a straight line or stand for long. After we had all of the pieces cut we had to wait until spring for the temperatures to rise enough to use epoxy. I had major surgery at this time to remove what was left of my cancer and it took a couple months to recover. I am now cancer free. 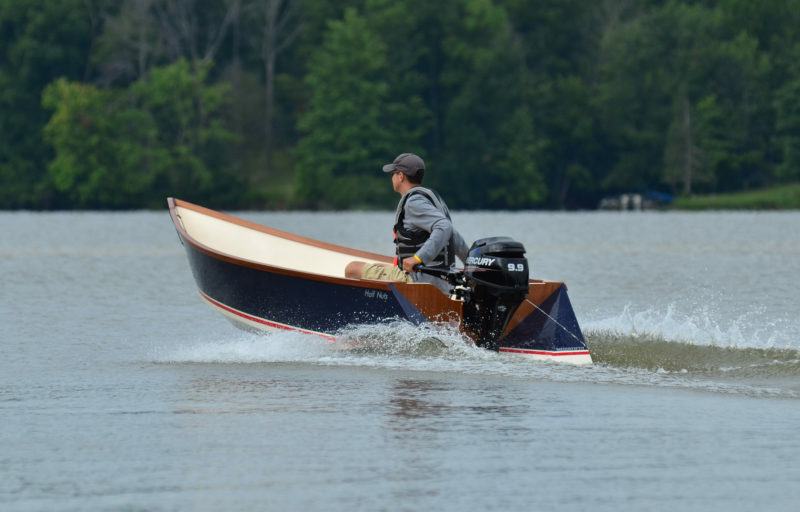 Chris Atwood is a 35-year-old corporate pilot and flight instructor, a metastatic testicular cancer survivor, and repeat boatbuilder having previously built a Glen-L Zip runabout and a CLC Wood Duck kayak. Downloaded plans for the Tango 13 are available from Tango Plans for $29. Beautiful boat. You can’t help checking out her rear as she goes by. Glad your health has returned. I had testicular cancer and I’m a little jealous I didn’t come up with that name for my own boat. Nothing like cancer to get you to see what’s important in life. Boats, mostly. What a great story. I lost my son to cancer last October—he was 38. We spent lots and lots of time crabbing in a 14′ utility skiff during his last summer on earth. The bond we enjoyed bloomed most fully during our crabbing ventures. It sounds as if your life became more meaningful with the building and bonding your boat afforded you. So sorry to hear of your son’s passing. Stories like yours are what motivates me to make every day count, Bob. Thank you. That’s a fine-looking boat and I like how the weight and balance issue was addressed with the sponsons. Beautiful color choice too. Congrats! Letting the side panels extend over bottom panels and filling is quite clever and the picture at lower speed shows how successful. Well done! I’m not sure why if a 10hp was the desired motor, a Tango 14 wasn’t built. Garage space? That is a beautiful looking boat! 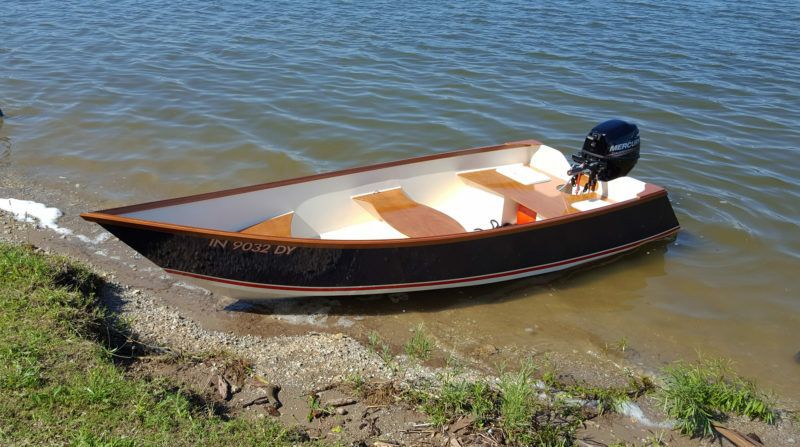 I’m thinking of attempting a build myself, and the Tango Skiff seems like a simple start for a boatbuilding newbie like me (but with some construction woodworking skills). May I ask how much resin and fiberglass is used in construction? I’m trying to cost out the build with local suppliers. I’m based in Ireland.